In the course of doing the research for Yokohama Yankee, I visited dozens of relatives and, wherever I had the opportunity, made copies of the photographs that they had. For many photographs, there were no originals. I always assumed that was because the originals had been destroyed during the fires the followed the great earthquake of 1923 and the firebombing during World War II. Without the originals, or anyone alive who recalled the images they portrayed, I often had to guess at their dates and locations. But after the Japanese translation of my book, my Japanese publisher at Akashi Shoten forwarded me a letter from Joji Tsunoda. 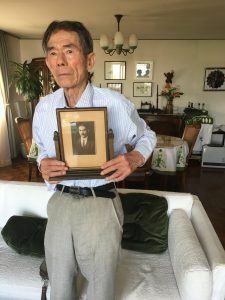 Tsunoda-san had seen an advertisement for my book in the Asahi Shimbun and wondered if I came from the same Helm family that his father and grandfather had worked for. If so, he told me, he had pictures to share. I arranged to meet with Tsunoda-san while I was in Kobe. Originally we planned to meet near a train station, but he suggested it might be more convenient if he drove to the home of the Tomimura family where I was staying. I figured this would be like many other contacts I had received: people who had known some member of my family. But this was very different. He came with a box full of albums, and thumbing through them I realized quickly that they were the originals of pictures my family had been passing around for the past century. 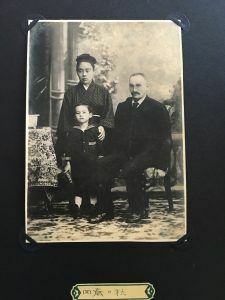 Tsunoda-san’s grandfather, Charles Wolf, had come to Yokohama from Denmark as a freighter captain and taken a job worked as the manager of the dock for Helm Brothers at the turn of the century. His Japanese assistant at Helm Brothers was good at cooking so he married her. They had a son named Ranso Wolf who was born in 1894. They tried unsuccessfully to get him Danish citizenship so he had to take Japanese citizenship. He went to Yokohama Shogakko (a Japanese elementary school) then to St. Josephs College, a catholic high school. Ranso was smart and studied calligraphy. He taught himself to speak German and read and write Japanese. He also taught himself photography. Tsunoda was his mother’s name. A quick Google search shows that Ranso Wolf worked as an assistant at Helm Brothers in 1912, according to the Directory and Chronicle for China, Japan Corea, Indo-china, Straits settlements, Malay states, Siam, Netherlands India, Borneo, The Philippines. Ranso was an amazing photographer and I will share his photos in another post.